NHS hospitals in England are so full that a shortage of beds is putting patients at an increased risk of infection, according to a report. An analysis of bed occupancy rates by the Nuffield Trust reveals that more than 95% of beds in hospitals were used every day last winter. 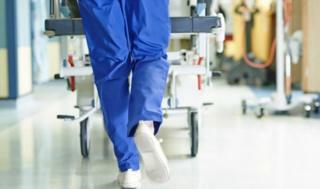 Hospitals try not to exceed 85% so they can deal with sudden admissions rises. NHS England has written to hospitals urging them to stop routine surgery over the Christmas and New Year period. It is standard practice for the NHS to cut back on elective surgery over the holiday period to free up more beds for emergency admissions. But this year the message has been "strengthened" and is more detailed, the BBC has discovered. Previous research has linked a shortage of beds to long delays in emergency departments and higher infection rates. Hospitals aim to avoid high bed occupancy rates to ensure that emergency patients can be admitted quickly. They also don't want patients to be moved around or placed on inappropriate wards to make room for other patients, and they need to have some slack in the system when numbers of admissions rise very quickly. Controlling infections and keeping everything clean can also be a problem if hospitals are too full. The Nuffield Trust analysis of hospitals in England shows that last winter the pressures on the system made sticking to a target of 85% of beds occupied almost impossible. On average, more than 95% of beds were occupied every day. On the single busiest day, more than 4,300 extra beds - which are used when the system is under intense pressure - were opened, equivalent to more than seven extra hospitals. One factor was the number of patients who were medically well enough to leave hospital, but couldn't be discharged because of delays in setting up ongoing care. Professor John Appleby, chief economist at the Nuffield Trust said: "With such high levels of bed occupancy linked to higher infection rates and longer waits in A&E, these pressures pose a real threat to the smooth running of hospitals and, ultimately, to patient safety. "What's more, the NHS is going into this winter in an even worse position than it was a year ago, with record deficits, worse performance against the A&E target, far more trolley waits, record delayed discharges from hospital, and fewer people getting the help they need with social care. "When you add into that mix the sort of intense pressure on beds we've demonstrated hospitals experienced last winter, patients' care is bound to suffer." An NHS England spokesman said: "This report looking back to last year points to the steps the NHS takes each winter to maximise bed availability, and plans are well in hand for this winter too." Chris Hopson of NHS Providers, representing trusts, said trusts were caught between a rock and a hard place - "the rock of coping with ever rising emergency demand and the hard place of meeting the referral to treatment elective surgery target and financial control totals where elective income is key. "Trusts chief executives tell us it's increasingly difficult to deliver both."